Simply check a box on the edit post screen, save, and your review (and rating) will be automatically sent off to Goodreads! You can choose to send the review immediately, or only once the review has been published (great for scheduled posts). Many people begin or end their reviews with a note about their book blog. Instead of typing that in manually, you can specify text/HTML to be included before or after every single review. You can even use a shortcode to automatically link to the original post. From the date of purchase, you’ll have free support (for one site) and automatic updates (for one site) to the plugin for 12 months. After that point, you can continue to use the plugin (forever!) but you’ll have the option of renewing your license key for another 12 months. The license key is what grants you access to support from me and automatic updates when the plugin gets new features or bug fixes. Fix: Non-admins unable to connect to Goodreads. The Goodreads connection button has been moved to Users > Your Profile. Fix: Show Goodreads connection errors more clearly. New: FTC disclosure is now added to reviews sent to Goodreads (when option is checked on). Tweak: Stop using CMB2 to create custom user meta fields. Tweak: Add more debug logs. Fix: Use https for all Goodreads URLs. Fix: Don't send review to Goodreads if post is a revision. 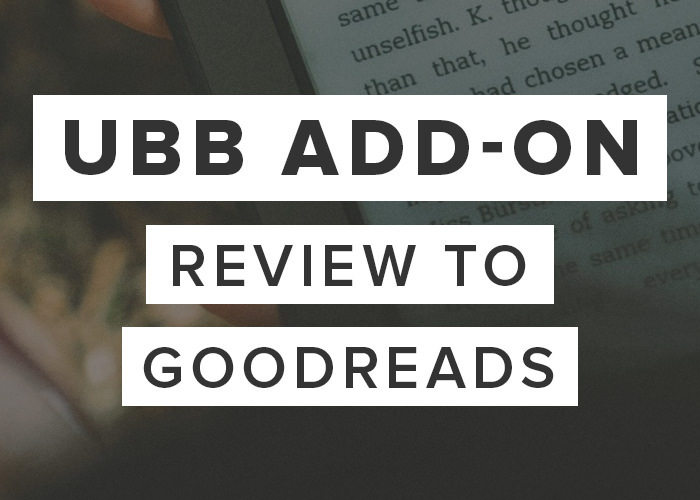 Fixed a problem where the full review may not be sent to Goodreads when sending "on publication". Fixed a problem where the dedicated review box wasn't being used when sending a review "on publication". Fixed a problem where reviews set to "send on publish" would not get sent when the post is published outside the admin area. Added Italian translation (thanks to Amazing Readers!). Added a link to the documentation. Commented out var_dump that was used for debugging. Tweaked some variable names to avoid duplicates. Fixed an "invalid argument supplied for foreach()" error when saving a page. Now the 'send_review_later' method doesn't run at all if the current post type is not a post. Fixed an "Invalid argument supplied for foreach()" error when saving a post. Now compatible with version 3.0.3+ of the Ultimate Book Blogger plugin. Added a new setting that allows you to set the "Read At" date. If enabled, the date for when you finished the book will be set to the date you submit the review. If disabled, no finished date is sent. Fixed a problem with the "Post to Goodreads when post is published" box not stayed checked after saves.